In order to maintain good health and independence, it's important for seniors to get the right nutrition facts. LoveToKnow Seniors asked Vicki Anensen-McNealley, PhD, MN, RN, the director of assisted living for Washington Health Care Association, for advice to help seniors and caregivers understand the best nutritional guidelines. Anensen-McNealley is in charge of education and consultation for assisted living nurses, caregivers, and administrators across the state of Washington. How important is proper nutrition for seniors? Recent studies have shown vitamin/mineral/nutrient deficiency links to conditions such as Alzheimer's, macular degeneration, heart disease, high blood pressure, some cancers, and diabetes, to name a few. However, these chronic illnesses can often be minimized through healthy living, including regular exercise and healthier food choices. It's a fact that people are living longer, and we must take a close look at how to make those additional years high in quality. The problem that we face now is educating people regarding what a "healthy diet" looks like. Where are the three biggest issues barring seniors from eating nutritious meals? That is debatable, and I can certainly think of more than three, but I'll narrow them down. The first big issue is loneliness. Many seniors live alone and/or live with depression and this can certainly cause a loss of appetite. Many seniors in this sort of predicament find that cooking for one is simply not worth it. Likewise, eating alone and lacking the companionship minimizes the enjoyment that eating had in the past. Another big issue facing seniors is a multifaceted one, but primarily involves logistics. Many seniors no longer drive, and may have difficulty getting to the grocery store to get needed items in order to prepare healthy meals. Likewise, many seniors experience health decline that only further serves as a barrier to getting out to the grocery store. The third issue, of course, is one of chronic illness and the associated affects that these diseases have on one's appetite. Many seniors experience chronic illnesses that are managed by medications, and often the side effects of these medications include loss of appetite, nausea, and the like. In addition, the aging body experiences changes such as decreased taste and smell, making foods that used to be enjoyable seem bland or otherwise uninteresting. 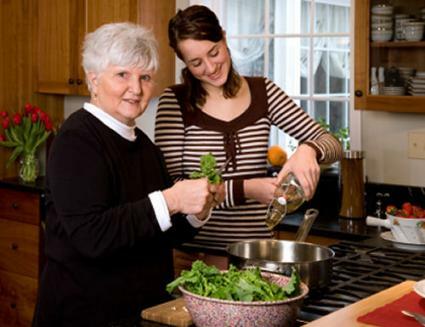 What can seniors and caregivers do to improve their nutrition education? There are so many fad diets, quick-fixes, and scams in the nutrition arena these days that it may be difficult to truly educate yourself on the nutritional aspects of foods. But, a great place to start is at the grocery store. Shop in the perimeter of the store - that's where the healthiest and most beneficial foods are kept. Fresh fruits and vegetables, low-fat dairy products, eggs, healthy whole grains, and lean meats are all there for the choosing! For the most part, foods from nature and in their most natural state are the healthiest choices and are easy to find. Use the latest food guide pyramid (below) that is specific to the senior population to help learn more nutrition facts, such as how much food, and what types, may benefit one's health status. Tell us a little about the benefits of nutrition therapy. This all depends on the definition of "nutritional therapy." I view this term in the broad sense and connect it back to the famous quote by Hippocrates: "Let food be your medicine, and let medicine be your food." Healthy foods keep us in excellent condition and keep chronic illnesses at bay, for the most part. The foods one chooses to eat certainly play a large part in one's overall health status. For example, eating low sodium, whole foods is a great way to avoid high blood pressure and is a much better (and cheaper) option than eating unhealthy foods and waiting for high blood pressure to attack, then treating the high blood pressure with medications while continuing to eat the unhealthy foods. Preventing illness through nutritional therapy has excellent health benefits and very few adverse side effects. How important is socialization for improving senior nutrition?Americans are social creatures for the most part. And good food and good company go hand-in-hand, and certainly that fact does not go away as we age. We tend to associate food with memories - fresh baked bread on cold winter days, warm chocolate chip cookies shared with friends after school, church potlucks, big holiday meals - the list goes on and on. Even those people living in assisted living and nursing home settings need socialization during meals. Many long-term care communities encourage their care staff to sit and enjoy meals with the residents they care for. This enhances not only the meal, but also the relationship between the caregiver and the person receiving the care. Please share with us some helpful websites or resources. 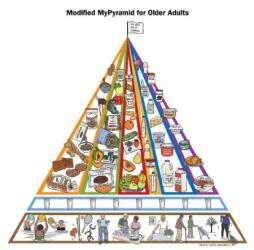 One of my favorite resources is Harvard's senior nutrition food pyramid. A version of the USDA's food pyramid, this is specific to older adults and emphasizes whole foods, plenty of fluids, and more exercise. It's not prescriptive, but rather a guideline that, when accompanied with discussion, can certainly assist in enhancing one's food choices for the better. Washington State also has a wonderful farmer's market resource for seniors on limited income. This encourages older Washingtonians to shop and enjoy local produce from farmers in their own communities. The USDA's national list of farmer's markets. The National Senior Farmers' Market Nutrition Program. The Mayo Clinic's guide to spotting malnutrition in seniors. Learn to avoid diet fads with information from LoveToKnow Diet.